Review: Humorous! Fantastic! Thrilling! Ortega, written by Maureen Fergus is a grand tale of a smart mouth gorilla and a demanding, self-centered scientist. How the two vastly different characters come together is no mystery at all once their stories are known. When there is trouble there will most definitely be Ortega with an angered scientist and a loving mother trailing behind. Right about now you would hear Ortega’s booming laughter and smug smile and then find yourself laughing with him. All Ortega remembers of his childhood is that he was taken away from his mother at a young age because he was needed in a scientific lab. Painful surgery results in him having the ability to speak English. Growing up shows Ortega to be the worst trouble maker Dr. Whitmore, a head scientist, has ever seen. For his whole life until the age of eleven, Ortega has been living in his room all alone. Then, when Ortega is being forced to go to school, he faces a challenge that he fears. With riots to harm him and people to ridicule him, he is expected to make friends and do well in this strange new habitat. After a terrible start, Ortega believes that he may actually survive school and be able to complete this session of Project Ortega. But like the many things in Ortega’s life, trouble finds him once again and this time, he may not be able to get out of it. A sensational read, Ortega shows how anyone can make friends no matter how different the person may be. Like many great adventures, Ortega finds himself gliding through every danger he comes across and always barley makes it past that danger. 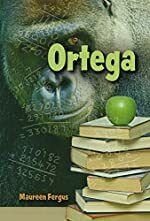 What makes Ortega such a wonderful read is that after starting off in the book as a smart mouthed, sarcastic, trouble making gorilla, Ortega learns important life lessons that change his attitude of people as well as life. I give this book five stars for its phenomenal humor and life lessons. Maureen Fergus has made reading a pleasure more than anything else. I also recommend this book to the ages of 9 years of age to adulthood because the humor found in the book is truly funny stuff - such as the cat and dog battles of Ortega and Dr. Whitmore. Books like Ortega are going to keep children reading for a long time, maybe even forever. If these books are like Maureen Fergus’s Ortega, I would not be very surprised at all. We would like to thank Raab Associates, Inc. for providing a copy of Ortega for this review. Have you read Ortega? How would you rate it?